At SMSF Coach and our Financial Planning arm Verante, we believe in your financial wellbeing and improving your understanding of financial concepts. We understand that the financial industry is full of jargon and concepts that can be difficult for people to get their head around or remember. 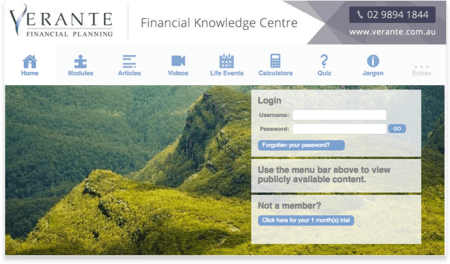 So to learn more about money and finance, our Financial Knowledge Centre is a great place to start. It contains a huge library of articles, life events, videos, quiz’s and calculators, so that you can learn about managing money while having a bit of fun at the same time. The best part of all is that you work at your own pace and we offer a free trial to one and all but it will always be free to our clients as part of our advice service. Watch this short video which explains what is available in this vast knowledge base. Ok this may seem like a boring question but have you actually checked if you have a copy of your latest SMSF deed on file or that your accountant and financial adviser have one of file? Has it been dated properly and signed and witnessed properly by all parties. In this era of everyone rushing around and having busy lives, it’s the little things that get missed and that can cause a huge problem later. An unsigned or undated deed may result in your fund being found non-compliant and unable to function or leave major headaches for your beneficiaries. If you are a professional adviser then those disgruntled parties will be looking for someone still alive to blame and pick up the costs. An SMSF trust deed is a legal document that sets out the rules for establishing and operating your fund. It includes such things as the fund’s objectives, what the fund can invest in, who can be a member and whether benefits can be paid as a lump sum or income stream. The trust deed and super laws together form the fund’s governing rules. regularly reviewed, and updated as necessary. I take over management of a lot of funds and we are seeing many cases where the original trust deed was signed correctly and dated but a subsequent update or deed of amendment is sitting on the file unsigned or undated. It is illegal to sign and backdate documents. As the Trustee of your fund it is your responsibility to ensure that deeds are legally compliant, signed and up to date. If you are an Accountant, Administrator, Financial Planner or Auditor then you may share in the responsibility to ensure that deeds are compliant and properly completed. Your client may love you but their beneficiaries may come looking for someone to blame if an unsigned deed means a compliance breach with heavy tax or administrative penalties. So what should you do. See if you have a SMSF deed in your files and check if it is properly signed, witnessed and dated. If you don’t have a copy then email your accountant and financial adviser and ask then to confirm if they have a signed and dated original copy on file. If they do then ask for a Certified Copy. If it has been updated with a Deed of Amendment, has that been signed and dated? Get a copy of all Deeds of Amendment for your records so you can show the full history of your fund. Keep a copy yourself in case you fall out with your professional advisers. Don’t be the one who leaves a mess behind! For many people setting up an SMSF, insurance is an afterthought but the law says that SMSF trustees must formulate, review regularly and give effect to an investment strategy that includes consideration of whether to hold insurance cover for one or more members of the fund. So that is why we usually have to do a needs analysis and work out where to place cover if required. After we have assessed a new member’s insurance needs we look at what you have in place already and replacement options. But often we need to work with what you have due to changes in health or disparity in premiums when comparing group and individual rates. The basic facts on health are that most of us have some sort of issue by age 45 that triggers further investigation and loadings or exclusions by insurers before they offer cover. The latter issue of premiums is rapidly changing as retail and industry super funds hike insurance premiums and move more towards individual underwriting. Our preference is to tidy up people’s affairs rather than complicate them and we do prefer to replace insurances where possible and use a combination of policies held inside and outside of your SMSF to maximise the breath and quality of cover while managing the premiums tax effectively. However where new cover cannot be obtained without loadings or exclusions we look at strategies for keeping existing cover in place. THIS IS WHY YOU NEVER ROLLOVER EXISTING POLICIES WITHOUT REVIEWING INSURANCES FIRST. One of the strategies we use is that when you start your SMSF we leave a portion of your superannuation balance in the large fund to retain the current covers. This is often because it can be cost effective retain life, total and permanent disability (“TPD”) and income protection insurance cover in a large fund. One of the advantages in keeping a balance within an existing retail/employer or industry superannuation fund is access to sometimes lower cost group insurance that has been arranged on a Group Insurance basis by the superannuation fund. Often, no medical examinations are necessary to have access to reasonably high levels of cover. Despite any advantages, there can be terms in these insurance arrangements that cause cover to cease. This could be unexpected and usually as a result of clauses found in a 40-50 page product disclosure document that you may never have read. Some of the common cancellation triggers we have found are are outlined below. A number of large super funds have a clause that states, if employer contributions cease for six/12/13 months, a member automatically loses income protection cover. We understand that this is a policy for certain large funds that offer members automatic income protection insurance. Usually one month before the cover expires the fund notifies the member that cover is about to cease. When it comes to employer sponsored funds we are aware of funds that require that a particular employer makes contributions to the member account or the insurance stops. TPD and income protection cover cease without notice if the member is no longer working for that employer after 60/71/90 days and their account balance is less than typically $1,500 or $3,000. Another fund cancels the Income Protection cover immediately on leaving the employer and no continuation option is offered whereas they do offer to continue the Life and TPD automatically when the member rolls over to a personal plan. To retain cover at many industry funds, the funds usually require that the member maintains a minimum balance in your account. The cut off point or trigger can be as low as $1,000 or as high as $10,000. While most large funds let members retain cover as long as premiums can be automatically deducted from their account, we are aware of a fund that will cease insurance cover for all insurances when the account balance falls below $3,000 and no employer contributions are made after 13 months. Some large government funds cease insurance cover if the member no longer works within the public sector. We are aware of some public sector funds where income protection cover ceases on the day the member officially ceases employment with the relevant public sector and no continuation option is provided. There is also another public sector fund that will cease all cover after 60 days from the last employer contribution or when the member stops working in the relevant public sector. Often these public sector funds do not accept further contributions from third party employers or rollovers from other funds. We are also aware of a funds whereby on terminal illness, the insurance can pay out at the TPD level, which is often lower than the amount of life cover especially for higher risk occupations. The payment reduces any remaining life cover paid on death. This can mean less funds are available to cover medical or palliative care costs while the insured is alive. Thankfully the standard method of terminal illness cover is to pay out 100% of life cover upon confirmation of a terminal illness with less than 12 months life expectancy. The kick in the teeth with this restricted payout is that it can also give rise to more tax because the non-dependant beneficiaries will receive the death benefits, as opposed to the member receiving benefits tax free before they die. Before relying on existing cover to continue ensure you read the product disclosure statement and policy document particular to your type of policy. do not rely on the latest PDS on the website as this may be for a newer plan and yours maybe an older plan closed to new members so the PDS may not be on the website. email for the exact the PDS you need to rely on so you have a record of the request. Likewise any questions should be directed to the super fund via email for clarification on exactly how insurance cover applies as we know you can get many different answers to the same question over the phone! Many funds see the employer as their client and may not give adequate warning when insurance cover is about to cease. Therefore it is important to monitor accounts and your contact details periodically especially where you may have elected for email correspondence. Many a cancellation warning has been sent to old email or previous home addresses. Most people who have not sat with a planner or read in detail the newsletters from their superannuation funds would believe that they can only access their superannuation when they actually retire and stop working. But there are so many other circumstances that could trigger an all-important “Condition of Release” and make your retirement funds available to you. In this guide for SMSF trustees I will concentrate on meeting the Retirement Condition of Release but you can find out about the other conditions of release here (click it later). The retirement condition of release is often subject to complexity and doubt. However, understanding the rules has become even more important after 1 July 2017 resulting from the 2016 Budget measures. The tax exemption on investment earnings supporting a Transition to Retirement Income Stream (TRIS)is no longer available. However, a TRIS will regain its tax exempt status once the ‘retirement’ condition of release is satisfied. Therefore, understanding what constitutes ‘retirement’ for an SMSF member in a TRIS is critical, to achieve that holy grail of a tax-free retirement pension. Death is the only condition of release that requires compulsory cashing of benefits. There is no requirement under any other condition of release to either cash out a benefit or commence an income stream from your SMSF, and member accounts can remain in accumulation phase indefinitely. If you do leave your member account in accumulation phase, it will be subject to an income tax rate of up to 15% instead of a 0% tax rate for investments backing a pension income stream. There is also now a $1.6m limit on how much can be transferred into an income stream. Reaching preservation age and retiring. Transitioning to retirement (after attaining preservation age): SMSF members who are under 65 and have reached preservation age, but remain gainfully employed on a full-time or part-time basis, may access their benefits as a non-commutable income stream. However from 1 July 2017 that income stream will not be tax exempt until you meet a further Retirement Condition of Release. Reaching age 65: a Member who is 65 years old may access their benefits anytime without restrictions. For superannuation purposes, a member’s retirement depends on their age and future employment intentions. A person cannot access superannuation benefits under the retirement condition of release until they reach preservation age. Once you reach your preservation age, the definition of retirement depends on whether the person has reached age 60. If a person has never been gainfully employed in their life, they cannot use the retirement condition of release to access their Preserved Benefits. Such a person would need to satisfy another condition of release to access their benefits (eg reaching age 65, invalidity, terminal illness, severe financial hardship). The trustee is reasonably satisfied that the person intends never to again become gainfully employed on either a full-time or part-time basis (ie for 10 or more hours per week). To evidence retirement, the SMSF trustee should request a declaration from the member that they have ceased work and they have no intention of being employed for more than 10 hours a week ever again. When a person has reached age 60, retirement occurs when an arrangement under which the person was gainfully employed has ceased on or after the person reached age 60. It does not matter that the person may intend to return to the workforce. This condition presents an opportunity for many people to move a taxed pension to tax exempt phase earlier. Michelle has worked as a nurse for many years. She resigns from this employment on her 61st birthday. Three months later, Michelle takes up a 3 day position as a grief counsellor. Because Michelle has ceased employment as a nurse after her 60th birthday, she can access all her superannuation accumulated up until that point. Situations sometimes arise where a person, aged 60 or over, is in two or more employment arrangements at the same time. According to APRA Prudential Practice Guide SPG 280, the cessation of one of the employment arrangements is the condition of release in respect of all preserved benefits accumulated up until that time. The occurrence of the ‘retirement’ condition of release in these circumstances will not enable the cashing of any benefits which accrue after the condition of release has occurred. A person will not be able to cash those benefits until another condition of release occurs (eg,s he also leaves her second employer). Frank (age 63) works part-time as a school janitor. During the school holidays, he had a short-term six-week contract to work as a Census form collector. The contract finished in September 2016. Because Frank has ceased one of his employment arrangements, he can access all his superannuation up until that point. However, any later contributions made (employer and personal contributions) and earnings will be preserved. Sometimes a person is both an employee and director of their own company. They may wish to cease their employment duties with the company, but retain their directorship. The question arises as to whether such a person (age 60 – 64) can access their preserved superannuation benefits. If a person is engaged in more than one arrangement of employment, the person can cease any arrangement of employment to meet the ‘age 60’ definition of retirement. Therefore, as long as a person’s two roles are separate and they terminate in their capacity as an employee of the company, then even though they are still employed in the capacity as director, that person can access their preserved superannuation entitlements. Note that there must be a distinct termination, ie cessation of all duties as an employee, and the person should now only operate in the capacity as a director for the company. We see this lot where often a spouse had helped out for years but as the children join the business or the business matures, the requirement for the spouse to continue turning up day-to-day reduces. They can step away from the duties as an employee but they may still handle the liaison with the tax agent on the financials, ASIC re company registration and the ATO to pay tax instalments, which are more akin to Directors Duties. When is a person gainfully employed? The preservation age to age 59 retirement condition of release requires that a member has no intention of returning to gainful employment on either a part-time or full-time basis. Someone is said to be ‘gainfully employed’, for superannuation purposes, where they are employed or self-employed for gain or reward in any business, trade, profession, vocation, calling, occupation, or employment. Gainful employment can either be on a part-time or full time basis. Part-time means at least 10 hours per week and less than 30 hours per week. Full time means at least 30 hours per week. another under any contract of hire (whether the contract was expressed or implied, oral or written), where the employer has the power or right to control and direct the employee in the material details of how the work is to be performed’. In contrast, self-employed people work for themselves instead of an employer, drawing an income from a trade, profession, or business that they operate personally. It would be expected that someone who claims to be self-employed would be running their own business (e.g. have a business plan, financial records, an ABN, a regular and frequent level of activity in the business, advertising etc). whether the activity is better described as a hobby, a form of recreation, or a sporting activity. Gain or reward is not defined in the superannuation legislation and therefore takes its ordinary meaning. The Macquarie Dictionary defines gain as ‘to get an increase, addition or profit’. Reward is defined as ‘something given or received in return for service, merit, hardship, etc’. In the context of satisfying the gainful employment definition, it follows that the service, merit, or hardship must be completed with some expectation of an increase, addition, or profit. That is, there must be a direct link (or nexus) between the activity undertaken and the reward provided for the activity. The actual level or amount of gain or reward does not necessarily have to be commensurate with the level of effort or activity undertaken. So, the level of reward could be relatively small yet still suffice – as long as there is a direct link to the activity being performed. Further, the reward doesn’t necessarily have to be received as cash, but could be received as services, fringe benefits, or other valuable consideration. The gain or reward element is typically difficult to satisfy in the case of charity or volunteer work. Non-paid work for a charity, for example, would clearly not qualify as gainful employment. Mere reimbursement of expenses would not seem to constitute gain or reward. Also, as discussed earlier, gainful employment for superannuation purposes requires an individual to be either employed or self-employed. Most charities or volunteer organisations will not consider their charity or volunteer workers to be employees. Transition to Retirement Income Stream (TRIS) condition of release allows a member to access their superannuation as a non-commutable income stream once they have reached preservation age. A non-commutable income stream for TRIS purposes is subject to a maximum annual draw down of 10% per annum. Preserved Benefits cannot be accessed through a TRIS as a lump sum until it meets the new “Pension phase” position. From 1 July 2017 the tax exemption on investment earnings supporting a TRIS is no longer available. The actual income stream (pension payments) will still be tax effective under 60 and tax free after 60. However, a TRIS will regain its tax exempt status once the ‘retirement’ condition of release is subsequently satisfied, for example, where the individual terminates employment at any stage on or after age 60. Reaching age 65 will automatically result in a TRIS pension becoming a retirement pension and obtaining tax exemption on earnings, if within $1.6 million pension transfer balance cap. The cessation must be genuine. Genuine terminations of employment will typically involve the payment of accrued benefits, such as annual and long service leave. SMSF trustees should retain written evidence of the member’s cessation of gainful employment on file and copy to the administrator so the fund auditor has access. Penalties apply to members, trustees and those who promote ‘illegal early access schemes’ to improperly access superannuation prior to meeting a condition of release. I am always on the lookout for good Australian educational content for new SMSF trustees and I know many people enjoy content delivered in short videos. Today we have another guest post but one with a difference. Owen Raszkiewicz from Rask Finance has a passion for delivering free educational content and has just completed his 15 part video course which is an introduction to investing in shares, managed funds and ETFs. The course is suitable for those starting out and a good refresher for experienced investors trying to explain concepts to other trustees. He has kindly agreed to me providing these 15 1-2 minute bite size videos here on my blog for you. I hope this course has been helpful and please scroll down to comment and make sure to visit Owen’s webpage Rask Finance for more educational content or follow him on twitter @OwenRask . Feedback always appreciated. Please reblog, retweet, like on Facebook etc to make sure we get this educational material out there. As always please contact me if you want to look at your own planning needs or an SMSF review. We have offices in Castle Hill and Windsor but can meet clients anywhere in Sydney or via Skype. Just click the Schedule Now button up on the left to find the appointment options. Why do SMSF Trustees need an enduring power of attorney (EPOA)? Not only do SMSF members need to have an up-to-date will but everyone who is a member of an SMSF needs to also put into place an enduring power of attorney. The Australian Law Reform Commission’s (ALRC) recommendations in its final report titled “Elder Abuse – A National Legal Response” are positive steps towards helping mitigate the risks that could face ageing self-managed super fund (SMSF) members. It involves changes to the superannuation laws to ensure that trustees consider planning for the loss of capacity of an SMSF member and estate planning as part of a fund’s investment strategy, and for the ATO to be told when an individual becomes a trustee of an SMSF because of an enduring power of attorney (EPOA). An enduring power of attorney (EPOA) deals with your finances if you lose capacity or are unable to attend to financial matters personally and/or as a trustee of your SMSF. Your attorney is able to deal with your assets in the same way that you deal with them (subject to any directions or limitations and being appointed as a director of the SMSF Corporate Trustee). This includes signing tax returns and financial statements of the fund, buying and selling real estate or shares, accessing bank accounts and spending money on behalf of yourself personally and on your behalf as trustee of your SMSF. For an EPOA to take your place as Trustee you must resign and they are appointed in your place. They cannot manage affairs of the SMSF using the EPOA alone, they must be made a trustee or a trustee director. This is because if a member loses their mental capacity, perhaps through having a stroke or suffering onset of dementia, they will no longer be able to be a trustee of their fund, or a director of the corporate trustee, putting at risk the complying status of the fund. Another occasion may be if a member departs overseas indefinitely. In this case their enduring attorney in Australia can become the trustee or director of the trustee in their place to avoid fund residency issues under subsection 295-95(2) of the Income Tax Assessment Act 1997. Scenario we handled: Judith’s father was in the UK and had a fall. She flew back to check he was ok but found it was worse than expected and that he would need multiple surgeries and rehab over a protracted period and she would need to be there most of the time to manage the process and care for him. Her son, James, was her EPOA so she resigned as Director of the Trustee Company and James used the Enduring Power of Attorney to allow him to be appointed as director with her 2nd husband for the 3 year period she was away. If you do not address the situation within the six-month period of grace allowed under section s17A(4) of the Superannuation Industry (Supervision) Act 1993 (SISA), the consequences for the fund and your retirement savings could be very serious indeed and attract severe penalties. Unlike a general power of attorney, an EPOA continues to operate in the event that you lose capacity. WHY SHOULD YOU HAVE A TRUSTED ENDURING POWER OF ATTORNEY? It is important to have an EPOA in place for each fund member because without it, in the event that you lose capacity, your next of kin would have to make an application to the NSW Civil and Administrative Tribunal (or relevant government body in your state) to obtain a financial management order to deal with your assets. This lengthy (often more than the 6 month grace period allowed under the SIS Act) and costly process can be avoided if you have the foresight to establish your EPOA in advance. It can also lead to major friction in the family and especially with blended families and outcomes you did not expect or wish for under any circumstances! Your nominated attorney should be someone whom you trust and believe would make decisions in your best interests. I often recommend that you leave written details of your preferences for dealing with asset sales, buy backs, dividend reinvestment plans, term deposit maturities, minimum pensions and add clear instructions if they should work with trusted advisers like Financial planners, accountants and auditors before making major decisions. You should of course consider having reversionary pensions or non-lapsing binding death nominations to ensure as much as possible that your wishes are carried out. So when next reviewing your wills and powers of attorney just ask your solicitor if they are confident that the EPOA would also cover Superannuation matters or if that should be specifically mentioned.